It wasn’t too long ago, in October 2017 when we debunked the lies of renewed Chinese aggression at Doklam, but for some unexplained reason, this lie just doesn’t seem to die down. I had explained that last time that for any Chinese troop build up to be of grave concern for India, the troop build up has to south of Sinchela Ridgeline. As long as the PLA build up, or presence is not south of Sinchela Ridgeline and not between Batangla and Gyanmochen, it is preposterous to say that there is ‘renewed aggression’ by China. The dispute, as seen from the image, lies in South Doklam. North Doklam and beyond North Doklam, the Yadong area, is undisputed Chinese Territory and China is well within their democratic right to increase PLA presence in their own territory. During the stand-off between India and China, India had objected to road construction in that area marked between blue and red lines. After disengagement, the status quo was agreed at 150m and that has not been breached. The Print article claims that China has “occupied North Doklam” with armoured vehicles and 7 helipads. For the layman’s benefit, this is like saying India has “occupied” Sikkim by increasing the presence of its own troops in its own territory. As mentioned before, North Doklam and the area beyond North Doklam, Yadong, are undisputed Chinese territory and China can do as they please. One wonders then, what does The Print mean when it says that this poses “New trouble for India”? PLA presence has always been there in Yadong and North Doklam and this phenomenon is nothing new. Increased presence, if at all, is of no relevance as long as the 150m status quo is maintained both by the Indian Army and PLA. “The new images show concrete posts, seven helipads, new trenches and several dozen armoured vehicles close to the point where the Indian Army and the People’s Liberation Army (PLA) troops were locked in a 72-day confrontation last year. The discovery comes days after Army chief General Bipin Rawat said that China continues to have troops in North Doklam but also added that the deployment had thinned down recently. However, new satellite imagery accessed by ThePrint from 10 December 2017 shows that the Chinese side is now well entrenched in the area, with heavy road building machinery still present close to the stand-off point”. The author insinuates that the so-called build up of PLA is “close to the point where India and China were locked in a stand-off”. In an area like that of the Doklam plateau, a few kilometres can potentially take days to travel, hence this assertion doesn’t hold water unless the author gives the exact location of troop build up and proves that it is south of sinchela ridge. Then, he goes on to quote the Army Chief, General Bipin Rawat who said that Chinese troops are present in North Doklam but the deployment has thinned. The author follows that by saying there is heavy machine deployment “close to the stand-off point”. 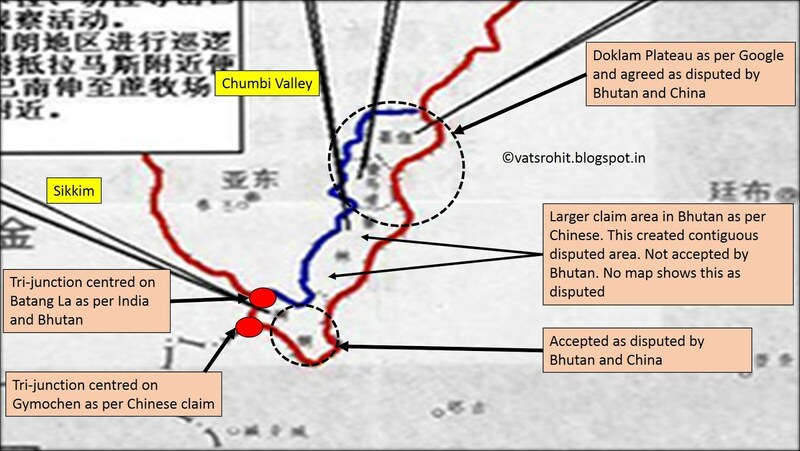 The author and The Print treacherously omit that North Doklam is Chinese territory and by repeatedly mentioning how it’s “close to stand-off point”, insinuate that there is already renewed aggression, an assertion that cannot be further from the truth. “A large number of troops seem to have been kept in tents under very good camouflage, but certainly not good enough for satellite imagery not to spot them”. Firstly, the stand-off was triggered because of ‘pakka road construction in the disputed site’. When the author seeks to fear monger based on PLA troops, living in kaccha tents in their own territory, one can only be thoroughly amused. I wish someone also informed the author, that if the troop presence can be so easily tracked by commercial satellite imagery, the troops are probably not trying to hide at all. It’s their territory and they don’t feel the need to. “New roads have been constructed to cover the North Doklam plateau. Work is in progress to widen existing roads. Most of the roads have communication trenches running along them”. This embarrassingly oft-repeated lie was also responded to by National Security Analyst Nitin Gokhale. Others pointed out that the Chinese are in their own territory and if they have 2 Battalions in their own territory, we have 2 divisions in ours, looking over them. Just as the last time this lie was countered in October 2017, this time too the propagandists masquerading as journalists came out to express their glee. Now, either they are truly ignorant and have no idea that this is a lie, or they know this is a lie but would like to further it anyway, hoping, it hurts PM Modi’s image, even if it hurts India’s image in the process. Either way, the jubilance was discomforting. These elements celebrating a lie, hoping that it were the truth, have conveniently ignored not only facts, but even the Army Chief General Bipin Rawat’s statement regarding the issue. The Chief said that they are present in North Doklam but the numbers have thinned down. That they have carried out infrastructure development, most of it temporary in nature. He said if they are there, we are also there (presumably, the chief meant that if they are present in their own area, we are present in ours too). He said if they come, India will face them but the mechanism of dialogue and to resolve such issues is functioning smoothly and he doesn’t expect any major trouble. But one has to be prepared. The questions that plague this entire fiasco is two-pronged. Why is this lie being regurgitated over and over again, with ambiguous language and wild assertions so as to confuse the reader into believing that there might indeed be some renewed tension between China and India. Every time this lie has been regurgitated, the articles have deliberately or ignorantly missed mentioning that the PLA presence is in China’s own territory and not in Indian or disputed territory. Are the journalists and politicians who seem to celebrate every time this lie is regurgitated aware of the ramifications such misreportage can have? China is known to be extremely well versed with psychological warfare and perhaps for the very first time, India is standing toe and toe and flexing its muscles right back. These attempts to sow seeds of doubt and weaken the psychology of the nation hurts not China, but India. Perhaps the most hilarious excuse for this kind of rabble rousing is that they are trying to “warn the army” to “stay alert”. I only wish they knew that the army knows it’s job quite well, and perhaps, they don’t need to concoct lies simply to get the army to do their job. One thus wonders, whose side are they on?